Cutting edge length: 5.75 in. Honesuki are Japanese boning knives. 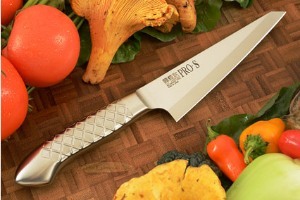 This knife is great for boning poultry, fish, and red meats but also amazing as a general purpose slicing knife! The blade is ground with a primary bevel on the right side and flat on the left. This makes it easy to cut along a bone without biting into the surface. Many chefs have told us that when they moved from a European style boning knife to a honesuki, the resulting meat was not only cut cleaner, but the process was nearly double as fast. The gently curved edge is combined with plenty of finger clearance over a cutting board, making this a perfect knife for thin slicing. 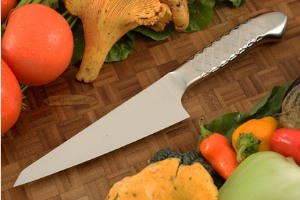 The blade grind makes this knife ideal for right-handed users. The Pro-S blade is a high carbon, high molybdenum, high vanadium stainless steel. It is heat treated to Hrc 57 and sub-zero quenched for longer edge holding and resistance to chipping and brittleness. 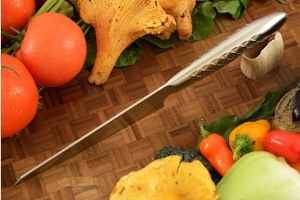 The blade is differentially ground to help food release from the side of the knife while slicing.